Here comes the Bride, All dressed in White! 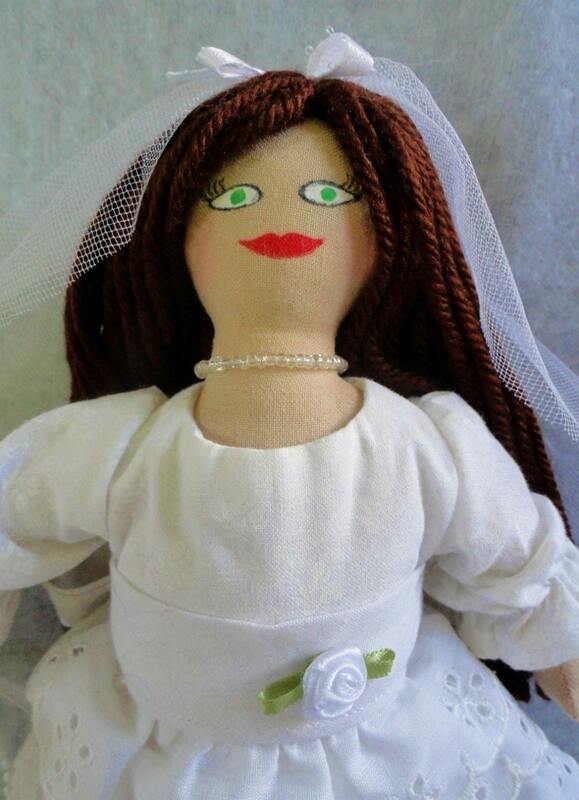 I'm the pretty Brunette Bride Doll, and today is the day I've dreamed about ever since I was a little girl. I am wearing a traditionally long white bridal gown with layers of white lace ruffles and a white ribbon rose on my waistband. My delicate tulle veil hangs to my waist, highlighting my long brown hair. My bridal bouquet is made of peach ribbon roses decorated with white ribbon and a string of pearls. I'm wearing a matching white pearl necklace, too. Hidden under my dress is a beautiful peach garter belt. I'm ready to walk down the aisle! Handmade by Joelle's Dolls, I make the perfect gift for anyone - a lucky gal getting ready for her own wedding, a child who loves pretty toys, or a unique art doll collector of any age. I'm about 9 inches tall and stuffed full of polyester fiberfill and anticipation.